Add in garlic and onion and cook until softened. Add in tomatoes, red pepper flakes and sugar. Add salt and pepper to taste and additional sugar if needed. Bring to a boil and cook until slightly thickened. Add in fresh basil and serve over pasta. Garnish with Parmesan cheese and additional basil if wanted. 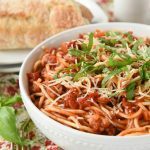 Spicy Tomato Pasta | Amatriciana Pasta was originally written by Leigh Anne Wilkes at https://www.yourhomebasedmom.com/spicy-tomato-pasta-amatriciana-pasta/.